In the eighth pAsuram, AzhwAr meditates upon emperumAn‘s assuming of a form which is part-human and part-lion, at once, due to the urge in protecting of his devotee which is greater than the quality of accepting the one who worshipped another dhEvathA. sella uNarndhavar selvan than sIr anRik kaRparO? emperumAn, assuming the huge narasimha form as said in “mahAvishNum“, effortlessly tore the body of hiraNya who was giving sorrow to dhEvas who grant results and was causing trouble to the world in various ways due to his boundless, great thapasya; even after hearing this amazing act of emperumAn from pramANams, will those who realise to go up to the boundary of his partiality towards his followers which is the essence of that incarnation, learn anything other than the glorious, valorous history of the SrImAn who has narasimha form? 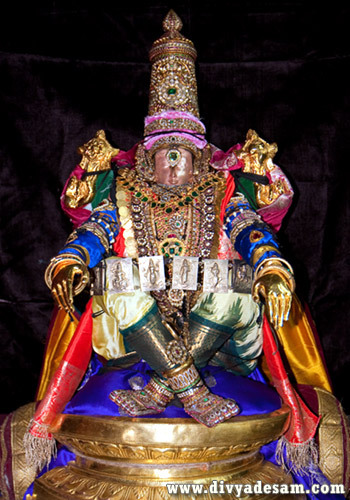 sella uNarndhavar – Those who realised to go up to the ultimate result of serving bhagavAn instead of stopping at the superficial results like worldly wealth and Athma prApthi (kaivalyam). Those who desire to enjoy eternally with him. Instead of stopping at the initial stage such as bodily matters, those who go up to serving bhagavAn, with true realisation of the true nature of the self. selvan than sIr anRik kaRparO – Will they learn anything other than the auspicious qualities of SrImAn (the opulently beautiful emperumAn)? It is said “innam sollAy sImAnai” (Tell more about SrImAn). ellai ilAdha perum thavaththAl – By boundless, great thapasyA. The boons were so powerful that the dhEvas were driven out from their own residences. pala sey miRai allal amararaich cheyyum – the body of hiraNya who is troubling them in many ways, not to let the dhEvas stay in their residences, and giving them sorrow. The effect of his troubles is sorrow. mallal ari uruvAy – mallal – greatness. As said in narasimha manthram “mahAvishNum” (The great vishNu), assuming a huge form, to make hiraNya’s form look very small. [Alternative explanation] mallal – wealth, implying “lakshmi narasimha” (narasimha with SrI mahAlakshmi); as said in “nArayaNO nrusimhas thu Sakthis thvam amarESvari” (nArAyaNa is narasimha and you are his power), he can not remain without her ever. seydha mAyam aRindhumE – Knowing well the amazing acts of emperumAn who appeared on the vow of the child [prahlAdhAzhwAn] instantaneously and tearing apart hiraNya’s body into two. What is so great about protecting someone who approaches emperumAn with purushakAram (recommendation) of another person? [the reference here is to the previous pAsuram where mArkkaNdEyA’s narrative was mentioned] Is it comparable to the quality of narasimhan emperumAn‘s protection with lion’s head and human’s body, when one’s own father [prahlAdha’s father] has become inimical? This is the quality of protecting as said in periya thirumozhi “peRRAr peRRozhindhAr pinnu ninRadiyEnukku uRRAnAy vaLarththu” (after my parents abandoned me, you remained my relative and raised me). This entry was posted in thiruvAimozhi, thiruvAimozhi 7th centum on September 11, 2018 by Sarathy Thothathri.